Virtual Realities: Powering the Future of Agriculture. 28 Mar Virtual Realities: Powering the Future of Agriculture. 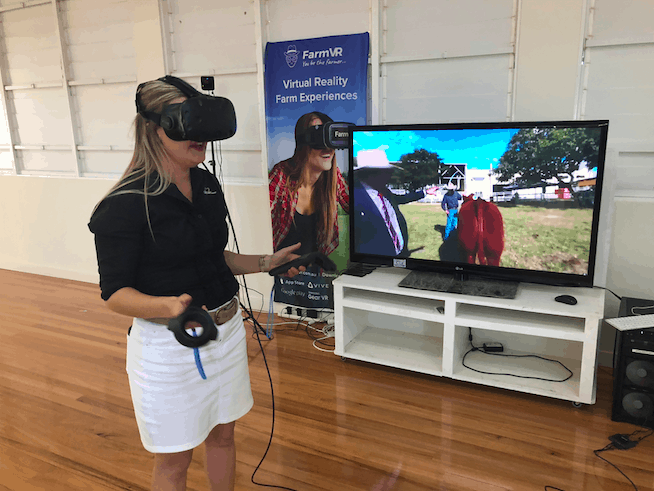 Capitalising on the opportunities that virtual reality could offer agriculture, an Adelaide-based company has developed a number of immersive experiences to help the industry fill gaps including training, education, sales and marketing. The company’s VR paddock-to-plate experience is helping children across Australia better understand where their food comes from. The classroom is a bus that Mr Gentle takes across the country, and the immersive experience takes the group on a VR chopper ride across the Dawson River to see where cattle are raised, all the way through to a look at the processes of an abattoir. The aim is not only to help children understand how food is produced, but to highlight agriculture as a progressive future career opportunity for the next generation. The same technology is being used to train those already working in the industry. Think Digital’s Farm VR World provides a simulated environment where participants and a teacher come together to up-skill. Current programs include chemical training where workers learn how to correctly arrange a chemical shed and how to deal with a chemical spill, minus the real-world risks. “This exercise combines 360 degree views of a virtual chemical shed with basic tasks to improve participants’ chemical handling skills, without the risks associated with exposing people to a real-life chemical spill,” said Mr Gentle. The use of VR technologies to train staff could provide a new level of risk management, in an industry renowned as high risk. A virtual marketplace for produce is also a distinct possibility, with the technology being used to record footage of livestock, saving buyers the headache of travelling significant distances to inspect potential purchases. Mr Gentle is taking this one step further with the launch of an online virtual livestock sale later on this year. In fact, he sees livestock as one of the sectors that VR technologies could add the most value. As well as connecting buyers and sellers, Mr Gentle sees that VR has the ability to help protect the sector’s animal welfare status.